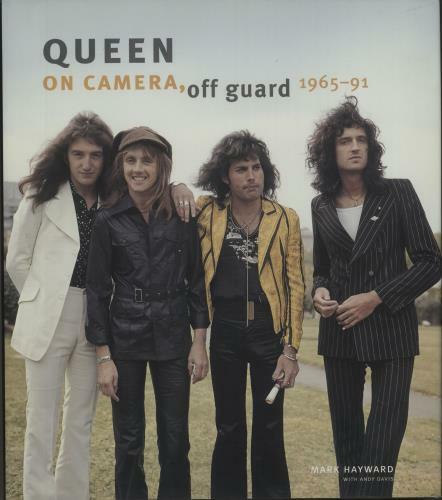 QUEEN On Camera, Off Guard 1965-91 (2011 UK 208-page 12" x 10" hardback book by Mark Hayward with Andy Davis. featuring a fantastic collection of rare images taken between 1965 to 1991. Includes the first ever photographs of Freddie Mercury asa performer with Ibex in Bolton in June 1969, early images of Mercury taken at Ealing Art College and outside his flat in Shepherd's Bush where Queen's first official photo session took place in 1973. Also includes images from their first Japanese tour, from the Fat Bottomed Girls cover shoot, on tour in South America with Mercury's boyfriend and many, many more. This publication provides an intimate insight into Queen backstage, onstage and at play. With picture dust jacket).